A Single Solution To Manage Composite Odors: Many resins used in the composite industry emit styrene vapors which are considered hazardous in high concentrations and whose odor is an unpleasant nuisance. This gas is categorized as a volatile organic compound (VOC) and listed by the United States Environmental Protection Agency (US EPA) as a Hazardous Air Pollutant (HAP). Styrene is considered highly reactive in the atmosphere and may contribute to smog formation and the production of secondary air pollutants. For this specific chiller applications which includes injection moulding , recycling, film blowing, extrusion, thermoforming and other applications HITEMA is able to grant high unit reliability and the cooling temperature control to achieve the targets of production capacity with also the aim to reduce the duration of production cycles and for energy and maintenance costs reduction. REDWAVE is a flexible system with applications in a variety of fields, especially for the plastics industry. No matter how complex the sorting task may be the REDWAVE range of sorting equipment can achieve high levels of purity. REDWAVE guarantees high waste throughput with effective recovery of required materials, achieving maximum return on the separated commodities. Using innovative systems, TOMRA Sorting enables you to reliably produce high quality yield, leading to higher profitability and greater ROI. Shredders for Plastics Scrap Size Reduction. Low cost alternatives for your waste plastics recycling equipments. Shredders for Plastic Scrap and E-scrap. Harden Machinery supplies single shaft and two/four shaft shear shredders for plastic scrap recycling and other solid waste size reduction applications. All of our machine are made in Chine with European design and Chinese cost. Our machines are being used in China and around the world. Over the years, plastics have become the most dominant engineering material for most products. All plastics are polymers; these polymers are further divided into two basic types: thermoplastics and thermosets. Extrusion can be used for thermoplastics. The raw material is in the form of pellets, granules, or powder. Meyer rotary valves are designed and engineered for dependable and reliable performance. The precision-engineered housing and rotor prevent material from getting jammed or sheared. By Wm. W. Meyer & Sons, Inc. based in Libertyville, ILLINOIS (USA). The innovative technique of plastics molding by means of utilization of nitrogen ensures the highest quality of the finished product with low production costs. By Fruit Control Equipments Srl (FCE) based in Locate Triulzi (MI), ITALY. Depackage and separate plastic containers and bottles from their contents using the Dominator depackaging equipment. Recovered liquids or products can then either be pumped to a holding tank or conveyed into a bin for further processing. Recovered plastics can then either be sent for recycling or sent for reprocessing. Packaged microwave meals, plastic water bottles, fruit juice drinks, HDPE containers, liquid paperboard, polymer bottles can all be depackaged successfully. Fluids Handled - Reactor Discharge and Transfer Applications for Monomers, Polymers. Resins and Styrene Monomer injection. The key to understanding the production process of synthetic plastic, rubber, or fiber lies in the four principle methods commercially used in polymer production. 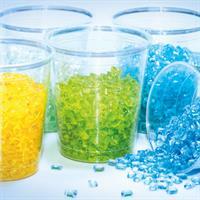 All polymers and copolymers are made by either the use of one or a combination of methods. These methods are bulk, solution, suspension, and emulsion. Plastic is a versatile material. Characteristics range from tough polymer structures to extra-firm high-tech materials. Efficient size reduction requires experience and know-how. We are able to customise our machine designs to be suit your requirements, for example; process configuration, footprint and throughput, thereby creating the optimum solution. As a renowned manufacturer of reliable plastics shredders, we offer special machines for in-house recycling and for heavily contaminated post-consumer waste. Due to its format, components and characteristics, plastic is a very versatile material that is primarily used in industrial mass production. The resulting plastic waste can be recycled by shredding and washing the material, before generating a reusable, recycled granulate. Shredded plastic waste can also be used for energy generation.